Syllabus of the Online Course (Subject): International Trade and Business in Rio Grande do Sul (Brazil). Description of the Online Course: Foreign Trade and Business in Rio Grande do Sul (Brazil). Over the past years, some companies from Rio Grande do Sul (Gerdau, Marcopolo, Artecola, and Lupatech), have joined the select group of the Brazilian multinationals. Rio Grande do Sul produces 67% of the Brazilian road cargo transport, 55% of harvesters, 50% of buses/mini-buses, 8% of cars and 1% of lorries. 576 Brazilian and international auto-Related companies in operation. The Footwear industry of Rio Grande do Sul is the responsible for 35% of the Brazilian production and employing 340,000 people within Rio Grande do Sul. The main hub of furniture production of Porto Alegre is situated in the Bento Gonçalves municipality with 298 factories including Italínea, SCA, Dell Anno, Todeschini, Criarae and Bentec. Estimated at R$ 203 billion, agribusiness represents 11% of state gross domestic product; 30% of wealth generated and 60% of exports. Main chemical/petrochemical hub of Rio Grande do Sul is the Triunfo municipality. International Trade of Rio Grande do Sul. Porto Alegre (capital of Rio Grande do Sul) was the tenth most populous city in Brazil. Microsoft, Dell, and HP are installed in the capital. Porto Alegre hosted the World Social Forum. Caxias do Sul is the second largest metal-mechanic hub in Brazil and one of the largest in Latin America. Pelotas is the commercial hub of the South of Brazil. Gerdau is the leading long steel manufacturer in the Americas and one of the largest special long steel suppliers in the World. It has 40,000 employees and an industrial presence in fourteen countries. 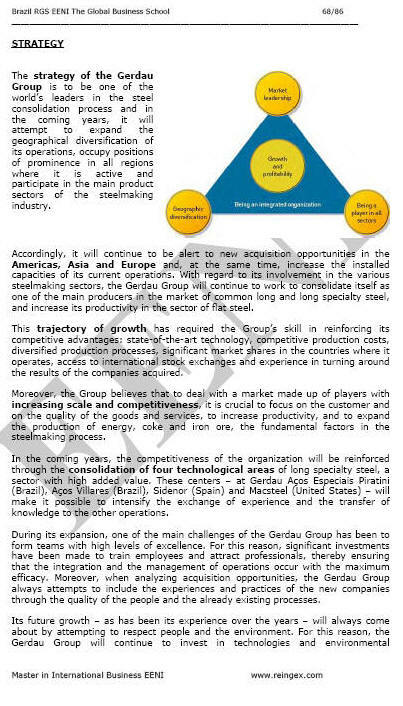 In countries where Gerdau has plants, its products are sold directly to customers and through Gerdau's own or independent distribution channels. Marcopolo is one of the largest bus manufactures in the World. Its bus manufacturing operations are conducted in eleven production facilities, of which four are in Brazil. Marcopolo has seven industrial complexes abroad, including one wholly-owned facility in South Africa, and joint ventures in Argentina, the Republic of Colombia, the Arab Republic of Egypt, India, and Mexico. Founded on August 6, 1949, in Caxias do Sul, Rio Grande do Sul, Marcopolo SA is a company devoted to road buses structures, urban and micros manufacture. Leaders in Brazil, Marcopolo is the responsible for near 50% of “carrocerias” of buses produced in Brazil. The company has four units in Brazil and factories in Argentina, Colombia, Mexico, Portugal and South Africa, with exports to 60 countries, including, the United States, France, England, Germany, Spain, Portugal, the Netherlands, Mexico, Argentina and Saudi Arabia. The consolidated results confirm the good performance of the Company experienced in recent years. Notwithstanding the adversities, on the one hand by the stagnation of the economy of the main markets abroad, and another, internally, by Economic unsteadiness, mainly by expectations of the results of the elections, the company exceeded the targets set by increasing local production and the units abroad. Especially in the Middle East, is highlighted as the largest supplier of this market. Footwear Azaléia is the largest company of footwear from Brazil. A philosophy of Footwear Azaléia reveals not only the attitude of his administration, but is this the way a company treats its employees, customers, suppliers, community and Government. The company also is showing the aggressive policy of internationalisation of their footwear. So the Footwear Azaléia S/A was indicated by the industry to receive the trophy Featured Export INSERÇÃO INTERNATIONAL. The company produces every year 45 million pairs, getting a gross turnover of 650 million dollars and generating 14,000 direct jobs and 3,500 indirect. In recent years; it has undertaken a series of actions to put the brand Azaléia in several countries. The success of the venture resulted in the installation of commercial offices in the United States, Peru, Chile, and the Czech Republic and is in negotiations with the United Arab Emirates and the United Mexican States. Today, the Group Azaléia exports 20% of the total produced. Rio Grande do Sul Department of Development and Investment Promotion aimed to economic development promotion, and, thus, the social conditions improvement. Its mission is to promote the sustainable development of Rio Grande do Sul. The Foundation of Economics and Statistics is a research institute of the state Government of Rio Grande do Sul, Brazil, whose goal is to assist economic and social planning.